From Customized Framing to Cross Stitching Supplies at The Rocking Horse, we understand how important using the right fabric material and style is to your project. 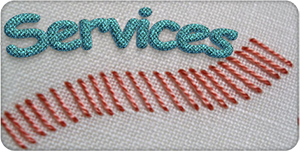 From cross stitching to customized framing, we treat your projects as if they were our own. Our friendly team of associates has years of experience in completing hand-made projects, sharing a similar passion for stitching and artwork. Allow us to help you throughout the entire process, offering recommendations and products that we feel will complement your piece. We are conveniently open Monday through Saturday, nestled in historic Downtown Farmington. Accessories: We offer a variety of needles in multiple sizes for your convenience, such as beading, cross stitch, curved tapestry, tapestry, and twin pointed quick stitch. Embellishments: Putting the finishing touches on your project can be the most integral part of the entire process. We offer a variety of embellishments such as beads, buttons, kits, and treasures. Fabric: We carry a wide variety of styles and colors to choose from. Fabrics that we offer include aida, lugana, Joblan, hand dyed by Stephanie, Zweigart and many more. Finishing: Allow us to give your special possessions a unique touch that will capture your personality. From stockings to bellpulls and pillows, our team is able to help you. Patterns: Working closely with a number of distributors, we are able to provide you with a wide selection of patterns that we are confident will meet your special needs and tastes. Floss Fibers: We proudly carry a wide variety of floss and fibers from several manufacturers, including DMC Floss, Classic Colorworks, Gentle Arts Samplers, and Weeks Dye Works.